Featuring a standard smooth body cartridge, the Model #130 is easily inserted into fittings, manifolds, or installed in-line. Pictured in orange polypropylene, the #130 is available in 8+ plastics, 4+ o-ring options, and opening pressure ranges from 0.17 - 20 PSI. One of our best-selling valves, the Model #132 features external o-rings to provide an extra barrier against leaks without requiring adhesives. 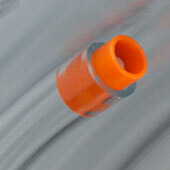 The #132 is available in 9+ plastics (Radel® is pictured), 5+ o-rings, and opening pressure ranges from 0.09 - 20 PSI. Primarily used for pressure relief, Model #13A is easily inserted into devices requiring a 3/8” size to include battery packs, tanks, and more. 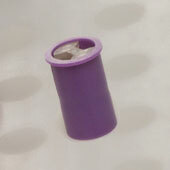 Featuring a flanged inlet, the #13A is available in 3+ plastics (pictured in purple polypropylene), 4+ o-rings, and opening pressure ranges from 0.17 - 20 PSI. 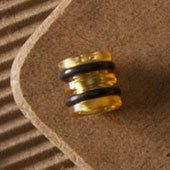 One of 13 end fitting options in our popular Series 300 Modular Valves, the Model #306 is barbed for 3/8" I.D. tubing. Also a best-seller, the #306 can be used as an inlet or outlet and paired with any other Series 300 options to include various other barbed sizes, NPT, or other styles. 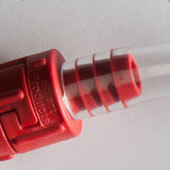 Pictured in red polypropylene, the #306 is available in 5+ plastic body options, 7+ o-ring options, and opening pressure ranges from 0.11 - 20 PSI.